We started the individual projects in August. After learning what Arduino can do, Marsha showed a great interest in producing a functional object that improves her daily life. Therefore, our first discussion focused on her wheelchair, which plays an important role in her routine. 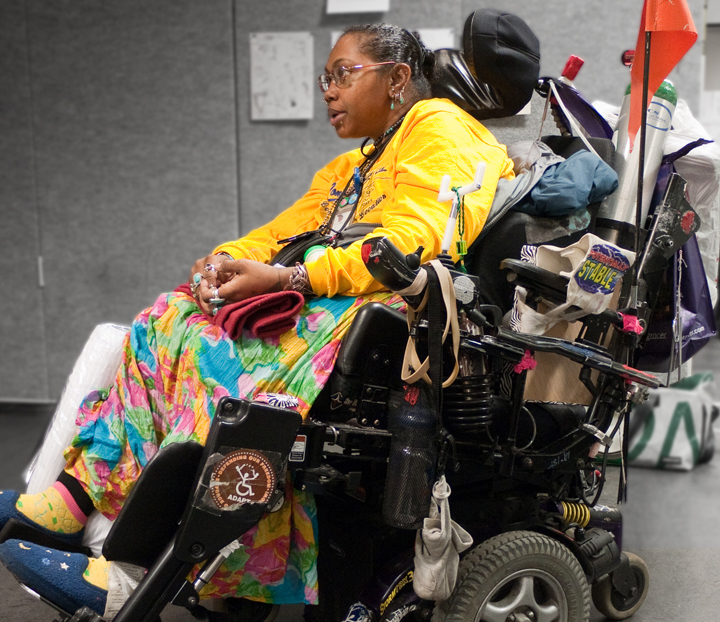 Marsha tends to keep everything she could possibly need on her wheelchair and within her reach so that she’s prepared for most situations. 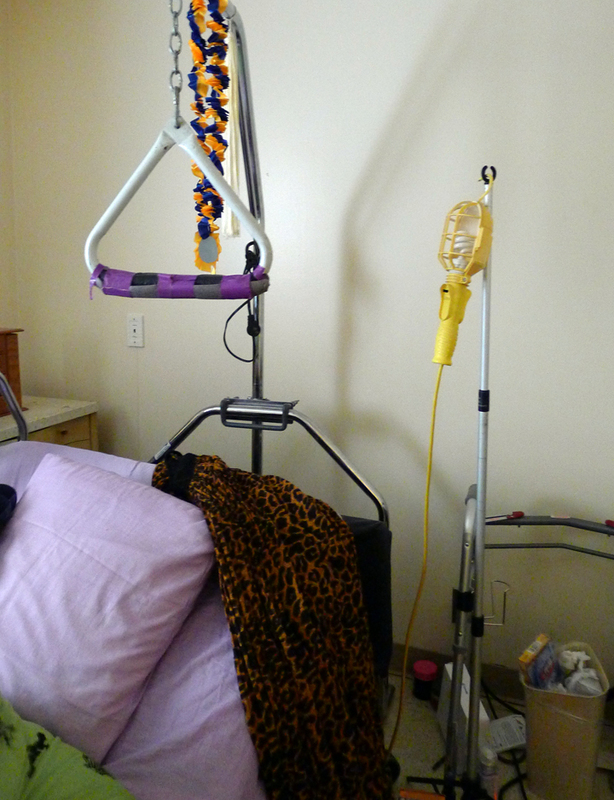 Then, our conversation moved to Marsha’s living environment and we discussed what a typical day is like for her. I even went to visit her in her apartment to really understand the daily routines and her environment (check out the blog entry Marsha and Chiaying to get a better sense of her apartment!). 1. 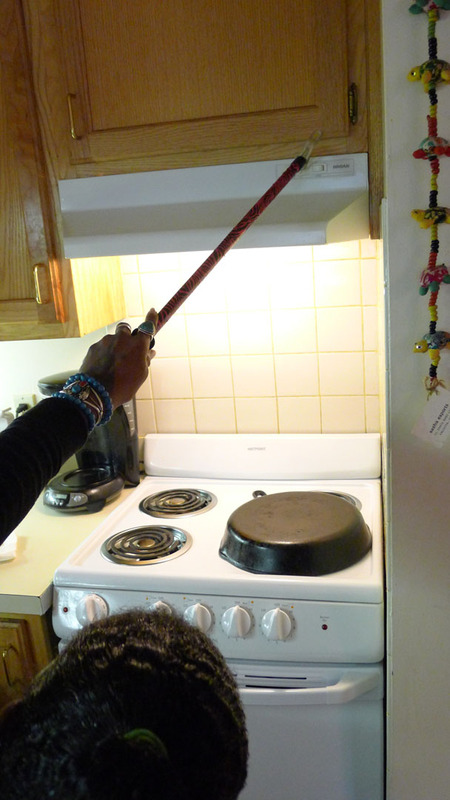 The light above the stove. She has to use a stick to reach the switch. 2. The light in the hall way. There are two switches to this one light and they seem to work intermittently but Mike solved this problem during our visit. 3. The lamp in the guest room. The connection of the wall switch to the outlet is broken. It’s difficult for Marsha to reach the switch on the lamp itself. 4. Switching off the light when going to bed. This is a particularly big problem because it means that Marsha has to get out of her wheelchair and into bed in the dark. This can be dangerous since falling can result. The switch by the door controls the lamp by the TV. She has to enter her room in the dark and get over to the lamp by her bed in the dark since she can’t reach the switch by the door from bed. The same problem occurs but in reverse when she gets out of the room in the morning when it’s still dark. Working collaboratively, we analyzed the problem and what we are capable of, and it led us to a practical yet unique solution. We decided to replace the lamp by her bed, so we don’t have to go into the wall and change the existing wiring. Marsha can have lighting if she wants to read in bed. We chose to hard-wire everything rather than use ultrasonic sensors because of the durability and easier programming. 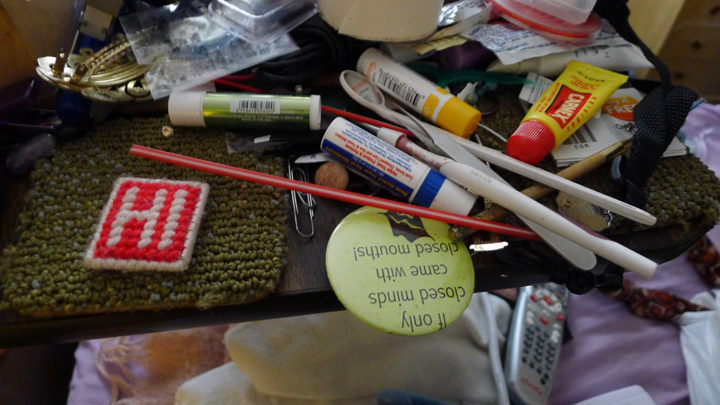 One on/off switch will be by the door and another one will be on the small desk that’s attached to Marsha’s bed. 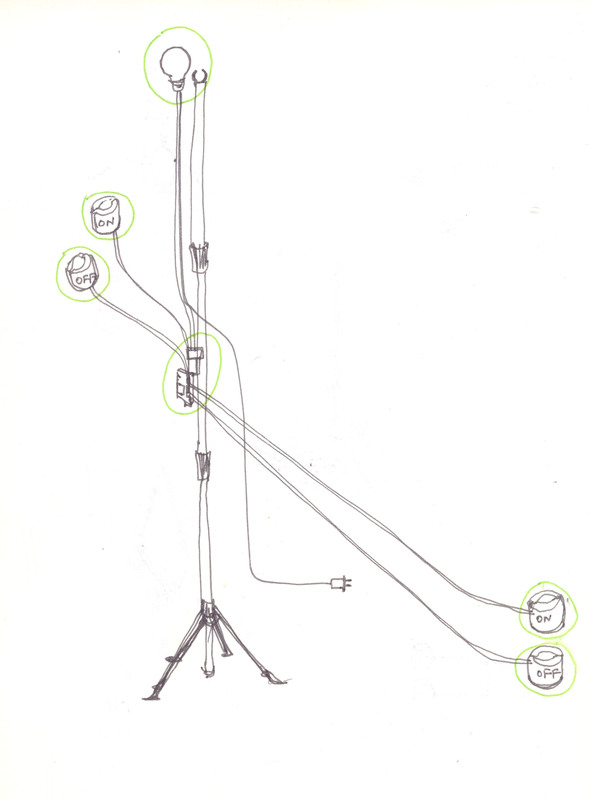 The green circles in the sketch indicate the places we can make our own decoration for the lighting device. 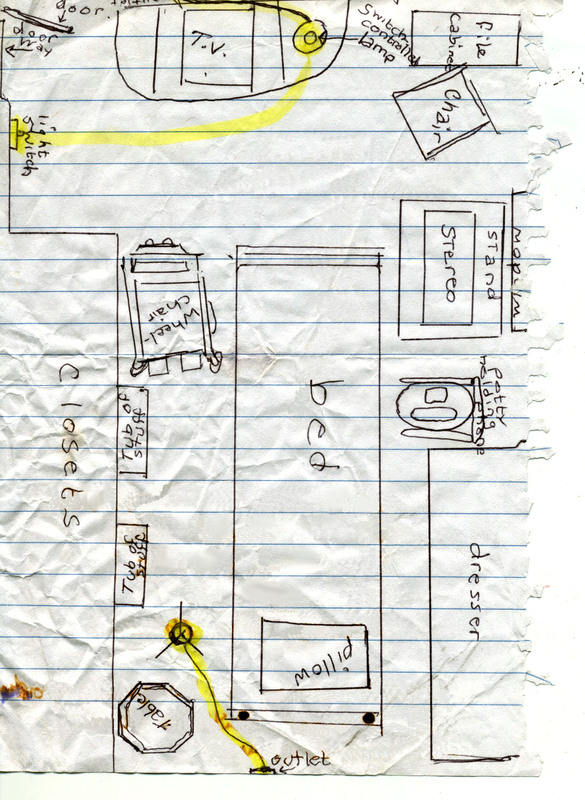 A rough sketch of our concept. – This small desk provides Marsha a lot of convenience. This entry was posted in Uncategorized and tagged collaborative design, Marsha, Marsha and ChiaYing by chiayingyu. Bookmark the permalink.